The Board of Directors of the Leo Baeck Education Center unanimously accepted the recommendation of the Selection Committee and appointed Rabbi Ofek Meir as the fourth Managing Director of the Leo Baeck Education Center, starting January 1, 2018. Rabbi Meir has worked at Leo Baeck since 1989 in a very wide range of positions throughout his 22 years of service. Rabbi Meir began his career at Leo Baeck as the youth coordinator of the Community Center, assistant to the rabbi of the Ohel Avraham Synagogue, and as a teacher and homeroom educator in the school. He established the Lorry Lokey International Center for Jewish Studies on the Leo Baeck campus that trains community leaders and educators from Israel and abroad. He established and was principal of the reorganized Elementary School, was principal of the Junior High School, and served as Deputy Managing Director and Rabbi of the Leo Baeck Education Center. 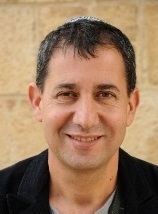 During the past two years Rabbi Meir served as Head of the Beit Midrash and Director of the Israeli Rabbinical Program at the Hebrew Union College in Jerusalem. Rabbi Meir earned a master's degree in Jewish Education and certification as a rabbi from the Hebrew Union College. He holds a BA in Education and Teaching Certificate in Jewish Philosophy and Jewish History from the Oranim Academic College of Education and a musician's degree in classical guitar from the Royal College of Music in London. His diverse roles at Leo Baeck over the years have, in the opinion of the Board of Directors, qualified him to successfully fulfill the position of Managing Director of the institution. Rabbi Meir will immediately begin a period of overlap with Dan Fesler, gradually at first and with full overlap as of October 1, 2017. At the end of Dan Fesler's service on December 31, 2017, Rabbi Meir will take over as Managing Director on January 1, 2018. "My Leo Baeck journey began in 1989 when I came to Yom Kippur services in the Ohel Avraham Synagogue for the first time. I was thrilled to see a new world unfold before me: a public school with a synagogue, extensive community social action programs, in-depth and ongoing discussions among staff, students, parents, and partners in Israel and abroad, on issues of education, Zionism, Judaism and community, and especially meaningful education towards pluralism and tolerance. I had finally found a home, a home that the public education system and public discourse in Israel had prevented me from knowing and meeting until that day. I immediately fell in love with the place and the people at Leo Baeck, and since then I continue to learn and to teach here, as a partner and innovator. The Leo Baeck Education Center is an outstanding example for me and many others of a community educational project with a great vision that knows how to realize and articulate it into detailed processes and action plans within the complexity of Israeli reality. I am very honored and excited at the privilege of heading the Leo Baeck Education Center and being the successor to Rabbi Dr. Meir Elek, whom I did not have the privilege of knowing, my rabbi and teacher Rabbi Reuven Samuels, who passed away about a year ago, and Mr. Dani Fesler, under whose leadership as Managing Director I worked, learned, and developed during the past 18 years." We wish Rabbi Ofek Meir great success in fulfilling his important role as Managing Director of the Leo Baeck Education Center.